Our chapter's signature design is used on a mouse pad. Enjoy it every day on your computer desk! Cost $5 plus $3.50 First Class mailing in a padded envelope = $8.50 total. Potential for less cost for shipping if more than one shipped at a time. If you wish to order, please contact us. ​Beautiful and sturdy natural canvas tote bag with red rose on staff design which was designed by a Rockford Alumna and used at a National Convention Dinner of Honors. 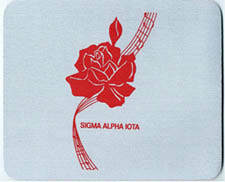 Also has SIGMA ALPHA IOTA printed near the design. Bag measures just over 14" X 14". Perfect size for papers, school work, books and music. Sturdy red handles.